The Internet has been awash with hints and leaks of a Tmo BlackBerry Curve lately, and it has all lead up to this: Magenta pulled the trigger today and announced the BlackBerry Curve 9360! Though business customers can order online immediately, consumer users will have to wait a bit to get their hands on the device. The Black phone will be available on September 28, with the exclusive Merlot-colored version following on October 12. In true BlackBerry form, the Curve 9360 will offer a BB-licious physical full QWERTY keyboard, in addition to the BlackBerry 7 OS. Other specs include 800 MHz processor, optical trackpad, 5MP camera with flash, VGA vid capture, NFC, 512 MB RAM, support for microSD cards (up to 32GB) and a 2.44-inch display (360 x 480 pixels, Liquid Graphics). The asking price is a mere $80, with 2-year contract and $50 mail-in rebate. For more info, hit up the press release below. Today, T-Mobile announced the upcoming availability of the BlackBerry Curve 9360, which combines powerful new BlackBerry features with an attractive price point. The new BlackBerry smartphone will be available in two stylish color finishes – black and merlot. Running the latest BlackBerry 7 operating system and utilizing the powerful BlackBerry 7 Webkit-browser, the BlackBerry Curve 9360 provides an intuitive smartphone experience, perfect for those who depend on their smartphone to keep their personal and work lives organized. The new BlackBerry Curve is designed to address a large and important segment of the global mobile phone market where customers are looking to upgrade their existing feature phone or existing BlackBerry Curve with an affordable, easy-to-use, full-featured and socially-connected smartphone. 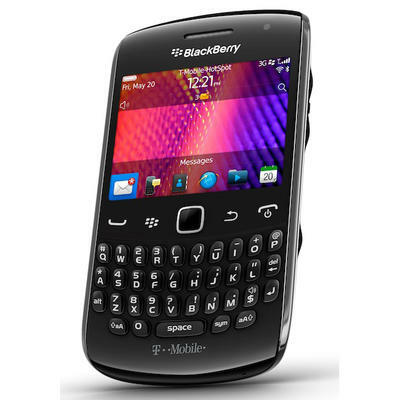 Encased in a sleek package, including a wide 2.4-inch screen, full QWERTY keypad and navigation track-pad, the BlackBerry Curve 9360 is ideal for efficient mobile communications. The new smartphone is also equipped with essential smartphone features such a 5-megapixel camera with flash, video recorder and Wi-Fi connectivity for voice and data for a premium smartphone experience. The next generation BlackBerry Curve smartphone delivers the world's best mobile communications and social experiences with the latest release of BBM™ (BlackBerry® Messenger) pre-loaded and now extends the real time BBM experience to a range of other apps, such as Foursquare, allowing users to easily interact with each other from within the 'BBM connected' app. The BlackBerry Curve 9360 is expected to be available in an exclusive pre-sale for T-Mobile business customers beginning today, Sept. 21. The smartphone will be available in the black color finish at T-Mobile retail stores and at select dealers and national retailers nationwide starting Sept. 28 and is expected to be available in an exclusive merlot color finish starting Oct. 12. The BlackBerry Curve 9360 is expected to cost $79.99 after a $50 mail-in-rebate card, with a two-year service agreement and qualifying classic voice and data plan.